One of the biggest draws when it comes to shopping anywhere in the States, is how well they do the whole Outlet thing. Us Brits are seriously missing out when it comes to Outlets. We have a few decent places, but they’re few and far between. 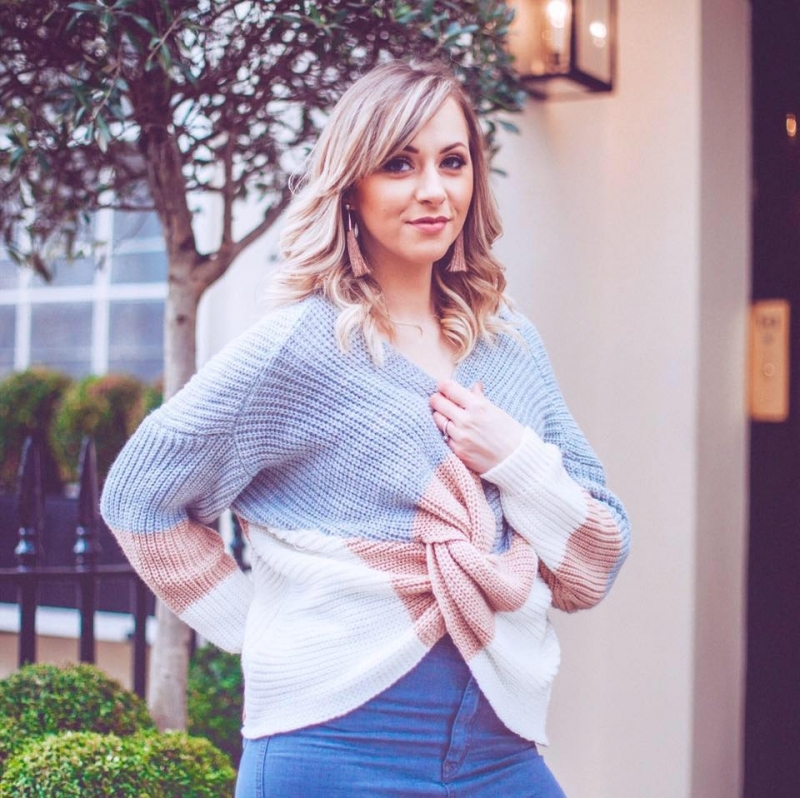 The Americans however are fortunate enough to know how to do Outlet shopping well – and so they have multiple options when it comes to bargain shopping. Before my trip, I spent time researching the best Outlet Mall to visit for the best buys, there were a couple of options, but for me the one I knew I’d visit would be The Mills at Jersey Gardens. I always do my research and was impressed by the 4.5 rating on Trip Adviser, plus several friends had been before and spoke so highly of the mall that it didn’t take much to pick this as my Outlet Mall visit. The mall itself is in New Jersey, and is really easy to get to. I was staying Manhattan, and the easiest option is to get the bus. Although a daunting prospect – it’s so easy, and I can’t recommend it enough. The bus leaves from Port Authority – a huge, multi level bus station complete with shops and plenty of places to buy food and drink for your journey. The tickets to The Mills At Jersey Gardens cost approximately $14 for a return (£10) and the take you directly from the bus station to the front door of the mall. You can’t go wrong as there’s no other stops and it has regular pick-ups and drop-off times throughout the day. If in doubt where the pick-up point is, just look for the huge queue of tourists – you can’t miss it. The journey takes 40 minutes maximum, the coaches are comfortably air conditioned and you’ll see the amazing skyline of Manhattan from further away – it’s a great photo op. The mall itself has over 200 stores, multiple places to eat and drink and an IMAX theatre too, so you can easily dedicate a full day to shopping, eating and taking in a movie, or just pop along for some tax free shopping and get back to the city within just a few hours. Store-wise the selection was incredible. Which once again reminded me how badly us Brits do Outlets, and how well the American’s do! They had a great selection of stores from fashion to home and big label brands to family favourites and American ‘high street’ stores too. Impressively a brand new Kate Spade store had just opened when I visited and I’m not even ashamed to admit that it was my first stop. 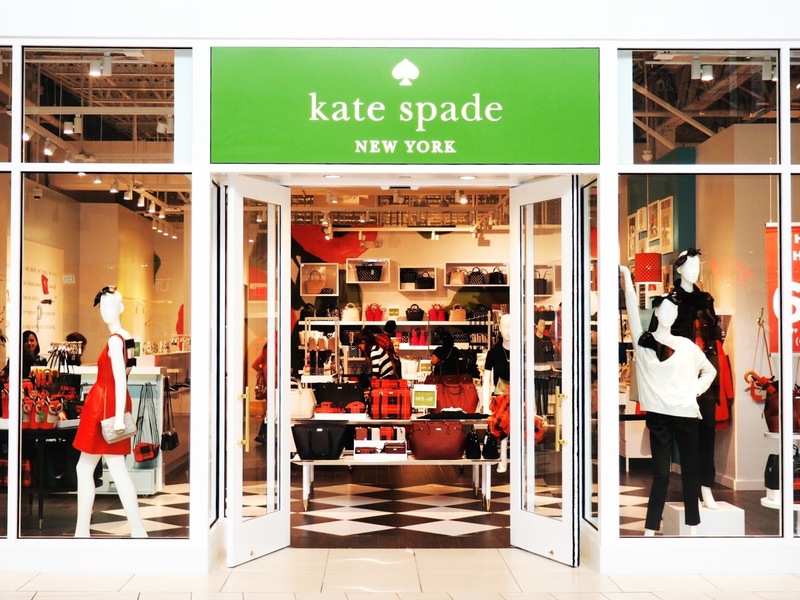 I’m a huge Kate Spade fan, I’m a sucker for their bags, planners, stationery and jewellery – and I’ve never been to an outlet store of theirs. The Mills At Jersey Garden has the most beautifully presented Kate Spade Outlet Store. In fact, it’s better styled and features a better range of products than the Kate Spade stores I’ve been to here in the UK. Price wise I was seriously impressed. The sought after Kate Spade planners were $90 (I paid £100 for mine in the UK sale) and jewellery was showing at 60% off too. Shoulder and tote bags were incredibly well priced from $129 and they had a massive choice of styles and colours. I was one happy Kate Spade fan. The Mills at Jersey Gardens also has…a Victoria’s Secret store! Only the day before I had been and spent a small fortune in Victoria’s Secret (the normal non-outlet store) so I walked in prepared to be shocked, but the prices blew me away. I paid $10-$15 for one pair of underwear the day before and found the knickers and briefs – boxes and boxes of them, all for $3.99! Plus a good selection of active wear and some of the pjs I’ve come to live in too. They had a good split of VS and Pink and catered for most sizes. They also had a good selection of beauty lotions and products at 75% off. If you’re visiting close to Christmas you’ll be able to get some amazing value gift sets here. Also another favourite was Steve Madden as I’m absolutely shoe obsessed. Steve Madden carried the current range and some previous seasons at great prices and then another favourite was Aldo, where they featured past seasons and outlet styles too. There are some great bargains to be found in those two gem stores. When it comes to my personal fashion style the stores I love are American Eagle, Hollister and Abercrombie. All of which have an outlet store in the mall. I was in shopping heaven. Price wise I picked up Hollister jeans for $25 (approx £19) sweaters for $19 and a dress I’d seen in American Eagle at full price – from the current range – with 40% off. I could have blown my entire holiday’s worth of spending money in those three stores alone. Other favourites included the Vans store, UGG, Guess, Nine West and Bath & Body Works. Plus I managed to pick up some bargain toys and gifts in the Disney Store and Toys’r’us outlets for my little boy. Food and drink wise there’s some lovely places to eat that suit your mood – whatever it is. You can have a sit down meal at Applebees, or just a pit stop at Starbucks like I did…twice! But I highly recommend paying a visit to the Cinnabon on the bottom floor. 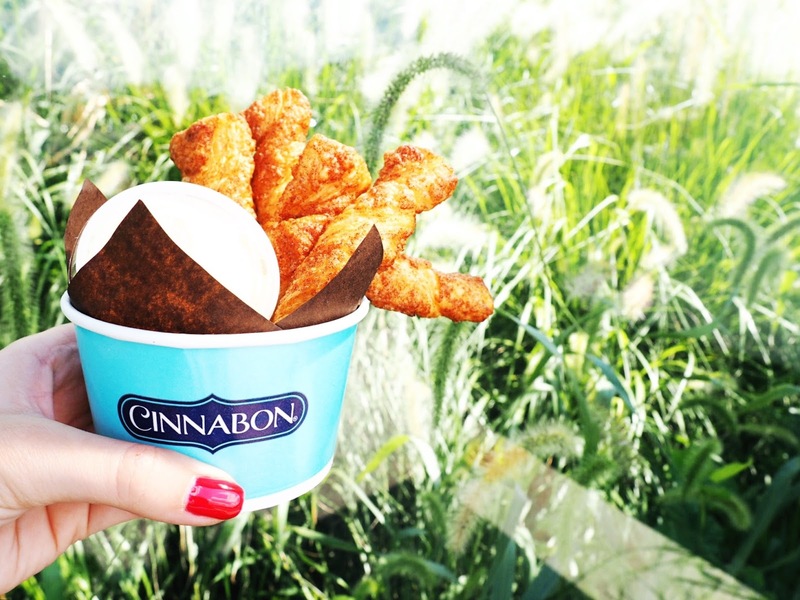 I’m a HUGE Cinnabon fan anyway, those delicious dough treats are irresistible and the scent as I walked past was far too much to resist. So I bought a snack immediately…and one for the bus journey back too. It’s not just that the choice of stores is so vast at the mall, but it’s clean, easy to walk round, modern and well kept. It’s a lovely place to visit and the stores have the perfect balance for an outlet mall. Not all are dedicated to outlet products, some carry current season stock, some don’t – but you’ll find a great balance of both. 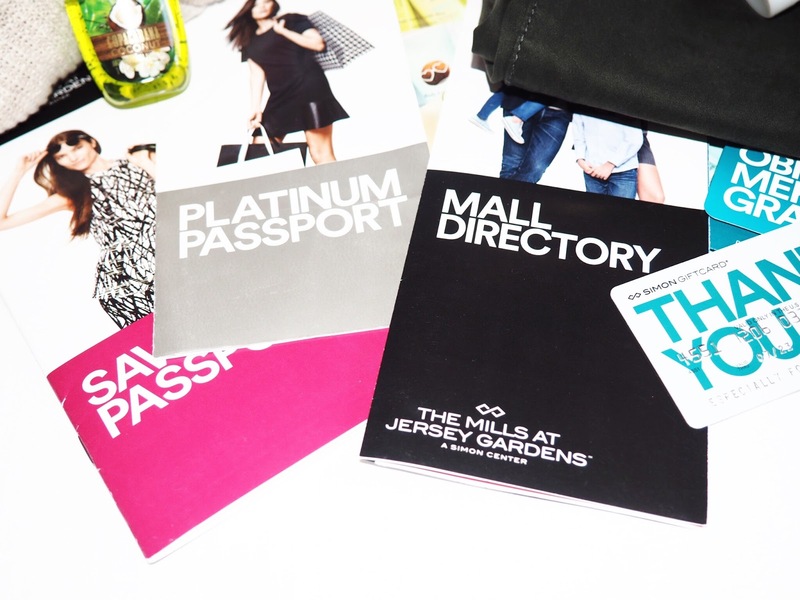 Not only is there tax free shopping, massive discounts and further reductions in most stores too, but The Mills At Jersey Gardens also offer a Savings Passport which you can collect from Guest Services on arrival. The Savings Passport gives you an extra saving in individual stores – almost all the stores in the mall submit a separate offer from 10% or 20% off the highest price item to a percentage off the total spend. Meaning there’s even more reasons to visit and spend! I took full advantage of mine. Naturally. 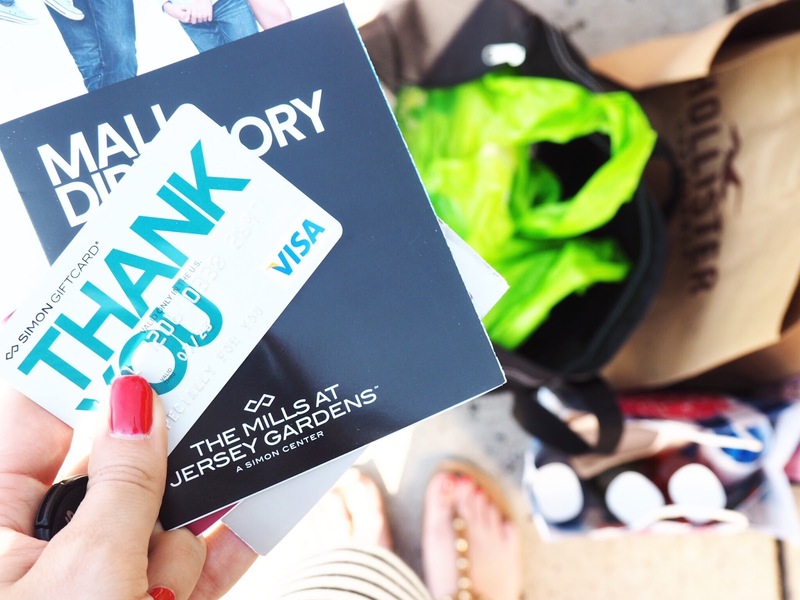 I did some serious shopping at The Mills At Jersey Gardens – I stocked up on gifts for my little man, some winter clothes for me and some treats from Bath & Body Works as well as purchases from Victoria’s Secret and many more. I basically couldn’t have carried any more if I tried. I had a great first visit and wouldn’t recommend any other Outlet Mall for the New York area. It’s got great stores, offers additional savings to guests, there’s dining and entertainment as well as shopping and it’s easy to get to and navigate round. You couldn’t ask for anything more. Thank you The Mills At Jersey Gardens for a fantastic day, I’ll most certainly be visiting again next time I’m in New York. This posts is a sponsored post, but as ever all opinions are entirely my own. Please refer to my Disclaimer page for more details.